Is Pedro Ximenez granite a possible Johnny Iuzzini cocktail ingredient? 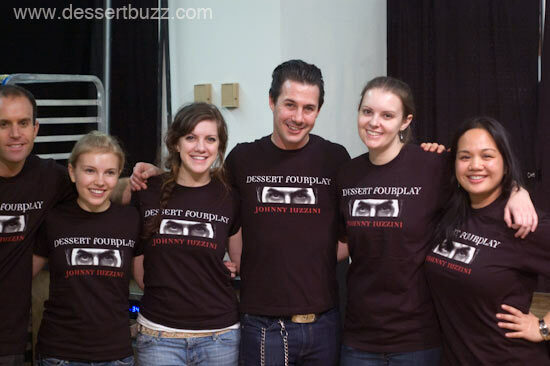 After nearly 10 years, Johnny Iuzzini’s last day as executive pastry chef at Jean Georges was December 31st. 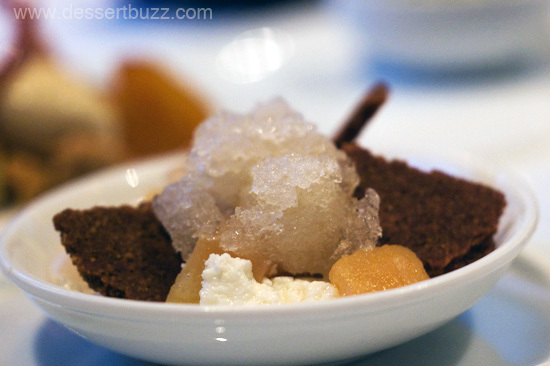 In yesterday’s post we covered the 15 plated desserts on his final menu at Jean Georges. In Part II (below) Johnny talks a little bit about his future plans, life after Jean Georges and some emerging dessert and food trends. Go here for part I.
Eater has already reported that Johnny will head to Italy in January to study gelato and has signed a new book deal for a basic desserts cookbook (no publication date has been released yet). 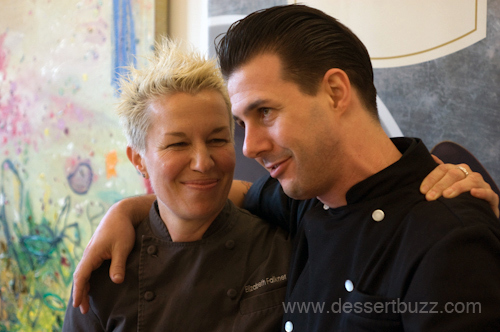 DessertBuzz: Johnny, you’re heading to Italy to study gelato–why gelato and ice cream? 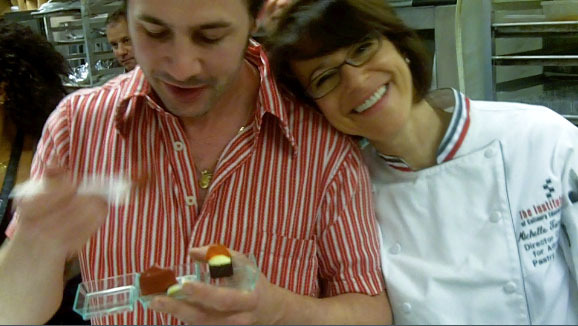 Johnny Iuzzini: People will always remember ice creams and sorbets. When you’re young that’s when you have these great memories [of ice cream and desserts] and that’s what stays with you. I have customers say “I remember this gelato or sorbet you made”–even from [a visit] many years ago. DB: So you’re going to Italy to learn from the source? DB: That makes sense. Didn’t you once say in an interview (RestaurantGirl) that when you were little you wanted to race motorcycles when your grew up? JI: Well it’s something I have been meaning to do (visit the factory and the museum) and just haven’t had the time until now. DB: What else? What about when you get back to NYC? Are you going to open a pastry shop like Dominique Ansel? JI: I’ll always love pastry and chocolate, and with chocolate there’s so much more to learn and do for me. But I have always wanted to do something with a bar concept. I love [the idea] of applying what I have learned to a cocktail bar–possibly branching out beyond NYC to hotels in other countries [eventually]. DB: I loved the Pedro Ximenez granite–put that in a drink and I’ll be your first customer. What about food trends like local food and farm to table? JI: Well, that shouldn’t be a trend, knowing where your food comes from. You have to be educated and knowledgeable about where your food comes from–if I am using it, cooking with it, you have the right to be able to ask where it’s from. DB: What about healthier desserts or desserts for people with food allergies? JI: I’m into how to bake healthier, not to an extreme but [with] an awareness of health. As far as catering to special needs, at Jean Georges we had a number of set menus for all kinds of food allergies and special needs (like Celiac disease) I wanted our alternative menus to be every bit as impressive as the regular dessert menu. If I have to send out a fruit plate because someone has an allergy, I have failed to do my job that day. DB: What about your team? JI: Oh, my team here is so great–I’m really going to miss them. I really want them to be successful. I want them to be better [more successful] than me. And on that note we wished the chef well and let the staff rush the dining room to prepare for the dinner service. For Part I of this feature covering Johnny’s desserts from Jean Georges, go here. Johnny Iuzzini’s website is here. Follow DessertBuzz on Twitter here. To see Johnny’s dessert from the 2011 New York Food and Wine Show go here. [This interview took place at events over the last 3 months as well as during last week’s tasting at Jean Georges].